This book deals with the migration from JES3 to JES2. Part One describes this decision. Part Two describes the steps and considerations of this migration. 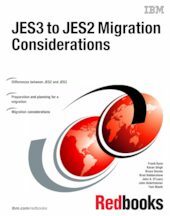 This IBM® Redbooks® publication provides information to help clients that have JES3 and would like to migrate to JES2. It provides a comprehensive list of the differences between the two job entry subsystems and provides information to help you determine the migration effort and actions. The book is aimed at operations personnel, system programmers, and application developers.